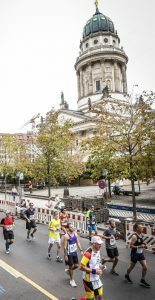 Berlin Marathon 2018. Everything that can go wrong will go wrong if you underestimate that you are still running 42.195 kilometres. Pros: Fantastic fast course, not a lot of sharp bends so you can really go fast. The route goes through some of the most iconic places around Berlin, crosses the Wall, as well, a few times. Plenty of refuelling stations. Very well organized with info arriving on the day at their app. Hundreds of volunteers to help you. Spacious showers and changing rooms afterwards plus the unlimited (non-alcoholic) beer at the finisher’s village. Lots of big names always participate and you can meet them if you like, either at the expo or at the afterparty. The expo is huge and has a lot of things to do and spend money on (not sure this is a positive). Berlin is a lovely city with lots of historical sites to visit, very good food and everything is easily accessible by means of public transport. Cons: Too expensive (100 euros). Not always suitable if you are aiming for a time because of crowding, however, the roads are wide enough to overtake. Hydration is a problem as they use really wide plastic cups so you practically have to stop running to drink. Timing is done via shoelace chip and not by a chip on the bib. Support is okay throughout and tremendous towards the Brandenburg Gate. I have to say in advance this is more of a calendar entry on how the race went for me rather than a detailed race report. I decided to put my name in the ballot for the Berlin Marathon sometime last October, having only done one Marathon prior to that (Manchester). 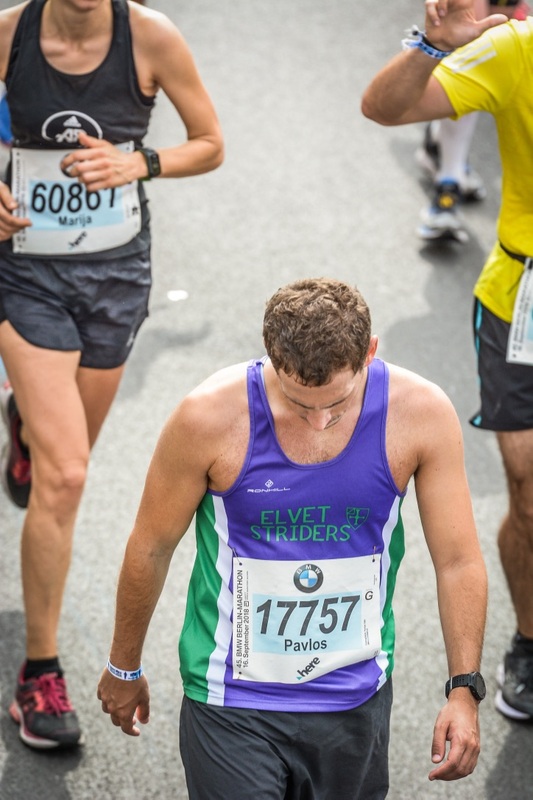 I was hyped as I was running the Athens Authentic Marathon 2 weeks after my entry into the ballot and I wanted to make sure that I kept this self-harm addiction (sorry I was meant to say long distance running) going! So, 6 weeks later I got an email saying that I got a starting number for the 45th Berlin Marathon in September 2018. Now I want to set the scene for what happened in Berlin. Between my signing up and being on the starting line, I ran two more Marathons. One in Athens (3:49) and one in Rotterdam (3:40). Thus, my secret hope and goal had become to aim for a sub 3:35 and a dream goal of sub 3:30. I decided to follow a harder training schedule this time. I am using Matt Fitzgerald’s 80-20 running book which has proven to be very helpful in setting up a schedule, etc. So, I went with the top level programme this time, considering myself an “experienced marathoner”. That was mistake number one. I should, by no means, be considered an experienced marathoner. This schedule included 3 x 20 milers, and its peak weeks averaged about 70 miles a week. I never managed to completely stick to any of those two parameters. 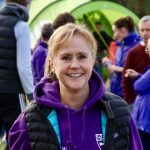 I injured myself twice during my 4-month training period: once something that felt like a stress fracture on my left leg and I was not able to walk properly for a day or two; and, once some really serious shin splints. This resulted in me doing four 16.5 milers and an 18 miler as my longest runs. The night before the race, I slept really well and I made my call. I was going to try and break 3:30. Go conservatively the first 2-3 miles, follow an 8-minute mile pace until the halfway mark, then go for a 7:55 until the last three miles and then go all out. And that was mistake number two. Skip to the starting line, in a 40 thousand long crowd of people ready to run the marathon distance. 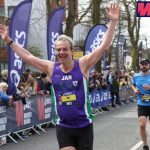 I had stated my only marathon time at the moment of signing up which was a 4:06 in Manchester, which put me in the second to last pen (about halfway through the crowd). I knew if I was going to go for what I was planning I was going to have to overtake a lot of people. Thankfully the roads were wide enough that this did not prove to be a major issue. We watched the start of the elites through a big TV screen in the middle of the crowd and the roaring screams that came out of everyone when Eliud Kipchoge stepped up gave me goosebumps. Everybody was discussing it, that he was going to do a WR, and somehow, we all felt a part of that. The gun went, the elites left at 9:15. Our start was at 9:35 so we sat there and watched the first 5k of the elite race, cheering for Eliud. Now mistake number 3 for me was to get overly excited by all of this and decide that somehow, I could smash my own 3:40 PB and celebrate joining the 3:20something club. In terms of nutrition, I had decided I would be doing an SIS gel every 4 miles and water at miles 6-10-15-20-22.5-25. When the race started, I indeed, went conservatively for the first two miles, doing an 8:34 and an 8:11-minute mile respectively. From then onwards and until mile 14 I started averaging 8:00 (sticking between 8:02 and 7:55). The course is very flat and offered a great chance of sightseeing around Berlin. You pass around the Reichstag Building, where the Soviets declared victory in WW2, you cross the Spree River a few times on several really pretty 19th-century bridges and you get to see parts of the Berlin Wall. If you decide to do this race, look out on the road for diagonal black brick lines (two bricks wide) with the words Berlin Maurer on them. It is where the Berlin Wall used to be. Kind of asks you to ponder along the road how many great things human beings are capable of (like a marathon) and equally how many terrible things we are capable of as well. Back to the race, at mile 6 (km 10) I decided to have my first water-stop. That is when I realised that water was delivered in plastic cups. This created two problems: a) the cups were too wide to drink water from, so it splashed in your face mostly and b) the route for 200 metres, after the stops, was wet and littered with plastic cups which make for an ideal slippery surface. I didn’t mind too much as I only needed a few sips, but I did not think of how that would affect my later race. When I got thirstier, by mile 10 I had to slow down to a fast walking pace for 10 seconds in order to get the water down. And this is where the problem started to manifest itself. Not noticing this was mistake number 4. A bit later after that, we heard on the speakers the last 30 seconds of the WR attempt. Everybody who was racing started clapping (even the non-German speakers after asking “did he do it” and finding out the answer, was yes and the time was 2:01). My water problems happened again in mile 15 which was basically the final nail in the coffin. After that followed an 8:27, an 8:52, an 8:47 and an 8:40 mile which was basically a first mini-wall. If I had the option to drink water from a Camelbak or a bottle at that time I think I would have saved it a bit. However, once again at mile 20, I had to stop and drink and then get going again. And that is where it happened. In my first marathon, I remember hitting the wall mentally and slowing down to 10-minute miles between miles 18 and 24. However, it was just mental. What I felt this time was nothing like it. This time it was physical. I started getting stomach cramps, which made it impossible to get the gels down (my body got them back out again) and started heading towards collapsing. The last six miles of this race was the toughest thing I have ever ran physically and mentally. 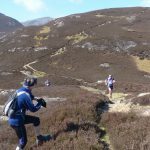 I could feel my body giving up, my stride was now a hobble and the pain in my stomach almost brought me to tears. Up to mile 25, I managed to keep at least jogging, stopping for water when necessary. I did that because I had decided that even if it meant collapsing at the finish line, I would not forgive myself for going above 4 hours. Knowing my walking pace is around 16 minutes per mile and when I started flailing around and getting blurry vision at mile 25, I decided I was going to start walking. It was the most dreadful feeling in a race ever. I felt I had let myself down, I had let my Club down, the people who came to cheer for me, everyone was going to be disappointed at what I was doing (not gonna pretend I did not get a bit emotional that few minutes). But suddenly at km 41, I could hear a roar from the distance and I knew the Brandenburg Gate was approaching. Let me just say that finishing under that, is an amazing feeling. Finishing under that when 2 hours ago Eliud Kipchoge has done 2:01:39 is even more amazing. I realised suddenly I was running on that man’s footsteps. I was in the same course that the greatest road runner of our time had just smashed a WR by a whole minute and brought the dream of a sub-2-hour marathon ever closer. That picked me up even more. 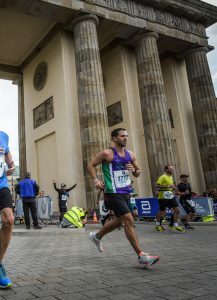 What gave me the final push was actually seeing the Brandenburg Gate in the distance and hearing a roaring crowd boosting me on. A really nice touch by the organisers at this point was that they had a guy with a microphone reading people’s names from their name tags and especially people who were obviously struggling (uhm, me). 10 meters before the gate I saw my girlfriend with her brother and her best friend cheering for me. I had told them to not come with the crowds just in case something went awfully wrong, but seeing them literally gave me the strength to go and run another 10 miles (okay maybe 3). So I went and gave her a hug and a kiss. They drove 8 hours in the middle of the night on Friday from the Netherlands to Berlin to see me run for 10 seconds in front of them so I felt this was the least I could do. Past the gate and then through the finish line in 3:54:55. My 5k splits until 40 km were: 25:49, 24:47, 25:19, 25:13, 25:46, 27:03, 29:03, 33:42 and the last 2.2 km were done in 18:18. That is the magnitude of how slow I got towards the end. However, although I had gone through hell and back in the last few kilometres, I finished quite happy. I had been reminded that there is a reason it is considered an unforgiving distance and that it is no easy task what you are called to do when you line up at the start. I had run on the footsteps of a world record, I can say I was in that course. And instead of all of this making me sad, it made me humbled. Also, even if the race went really, really bad for me I still want to go and do it again. 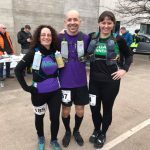 Just to prove that having learned my lesson, I will not underestimate the distance again and I will learn to plan ahead (and actually read the website for once and check if they do water bottles or cups).